← Digitaler Salon in Berlin: How do Blogs score in contemporary media league? 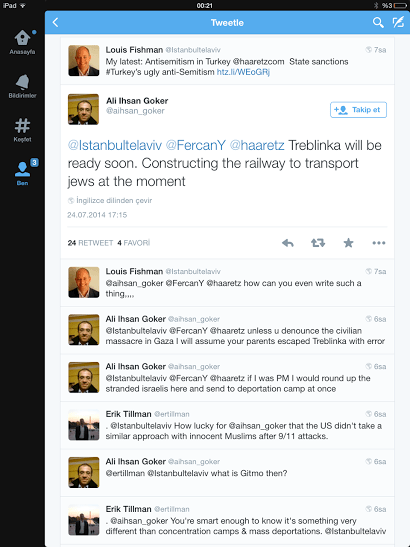 There has been a steep rise in antisemitic hate speech and attacks in Turkey over the last few years. Especially during and after every Israeli offensive in Palestinian lands. Most recently some racist and violent groups have taken up the excuse of Al-Aqsa Mosque provocations and used this is a pretext to attack Turkish-Jews and synagogues. In order to protest against the rising antisemitism in Turkey and commemorate the horrific events of the past, Say Stop has held a protest meeting with dozens of participants. When activists were gathering in Galatasaray Square in Taksim’s Istiklal, right next to the venue was placed ten times more policemen than activists as usual. The moment banner was opened, interestingly enough some people came to ask questions in English, thinking anyone protesting antisemitism would come from abroad and not from within Turkey. It was also interesting to hear questions as the the meaning of the word “antisemitism” as some of the passer-bys did not know what it means. In fact, this happened to be a protest in delay. There was supposed to be a protest meeting to commemorate the Kristallnacht and rising antisemitism in Turkey the week before. This commemoration would be taking place in the open air for the first time in Turkey, yet due to several reasons it did not happen. As “Say Stop” collective of anti-racist activists was preparing for the commemoration, attacks to Neve Shalom Synagogue came as a bad surprise. On November 7 and 9 two attacks took place, significant for the timing also because it was just a week before the 11th anniversary of Al-Qaeda attacks on Istanbul’s Neve Shalom and Beth Israel synagogues, which took place on November 15th, 2003, leaving 27 dead and 300 wounded. There are unfortunately many groups that take courage from notable people’s antisemitic rhetoric and hate speech that goes unpunished. Over the summer of 2014 when there was the Israeli offensive in Gaza killing thousands, the head of constitutional commission from the governing AKP Samil Tayyar had tweeted “may your ancestors perish, may your Hitlers be abundant”, which then led a wave of antisemitic support on social media. Much like several politicians and musicians who had such rhetoric at the time, over 30.000 people used similar remarks most of which would be considered hate speech. This hate speech was later followed by one shop keeper putting up a sign that stated “jew dogs can not enter”. Say Stop has been campaigning against racism, nationalism, discrimination, and is an all-inclusive collective of activists which had slowed down on activities for some months last year. Just when activities were to be kick-started once again with the “racist of the month” ‘award’, then came more than 30 thousand candidates in a month which made things a little bit complicated; so for the month of July, collective Say Stop declares all antisemites as “racist of the month”. And once again, the activists of Say Stop / DurDe will be with all those that are being targeted out of hatred, for their origins, religion, language, choice, preference, status, etc. Just like any other group that Say Stop campaigns in support of –such as Armenians, Roma, refugees, immigrants, LGBTI individuals- the Jewish population is not alone either. This entry was posted in Far Right, Hate Speech, Istanbul, Middle East, Racism, Radical Right, Turkey and tagged antisemitism, antisemitisme, antisemitismus, beth israel, discrimination, durde, hate crime, hate speech, istanbul, jew, jewish, neve shalom, racism, say stop, synagogues, turkey. Bookmark the permalink.